I personally think that making resolutions for the upcoming new year is ambitious as there is a fair chance that I might not be able to live up to them. With the end of the year 2009 and the arrival of the brand new year, I take this as an opportunity to reflect upon myself and think about ways to further improve myself. Whether you are a college student, a high school student or a working adult, there are plenty of resolutions that you could make to further enhance your study/working experience and to put yourself right on track for a successful future. Anyway, in light of the potential for a change, I have come up with my own list of things that I want to do or continue doing. 1)Put on a significant amount of weight. Being underweight prevents me from donating a full pine of blood. Besides, I need to start impressing the girls. 2)Step up to be a better human. As a son and a brother particularly. They have been awfully neglected. I shall try my best, despite the heavy schedule that I am expecting to have. 4)To mold the character of a helping doctor to those who are really in need. 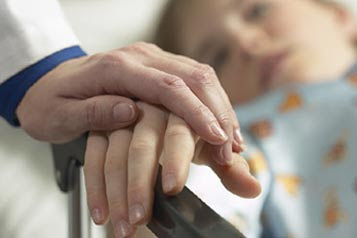 To treat every patient with utmost respect as if they are my loved ones. But prior to doing that, I shall equip myself with as much knowledge as possible so that I know, I know so clearly that, the patient will not be in anyway being disadvantaged by my incompetency, and this patient is safe under my care. 5)To be the best student I can be, an active learner, a team player as well as a leader. This is the last post for the year and I look forward to the new one. Work in the lab ended early today. Majority of the people in Prince Henry's Institute are already in Christmas mood, conversation topics often revolve around the celebration of this upcoming festive season. Since I have half of the afternoon free, I attended an exhibition on medical history, " A Doctor's Delights: Discoveries from the Richard Travers Collection" held in Sir Louis Matheson Library. Have you ever pondered how the word "medicine" came about? 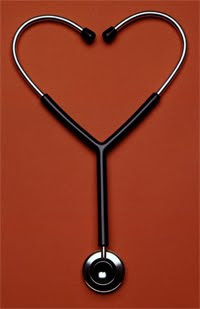 The word medicine is actually derived from the Latin "Medicina", meaning the art of healing(Wikipedia). Early records on medicine have been discovered from early Ayurvedic medicine in the Indian continents not forgetting to mention about ancient Egyptian medicine, traditional Chinese medicine and Greek medicine that uses animals,plants and even bodily fluid as therapeutic agents. Since then, medicine has improved by leaps and bounds as what we can observe today owing mainly to the invaluable field of modern scientific biomedical research. Some of the medical books and artifacts displayed there were from the 16th centuries, indeed intriguingly arousing. 20 mins of my life was spent walking down the memory lane of medicine. Looking at the history of medicine shows how ideas have developed over the centuries. Medical barbers were the fore-runners of today's skilled surgeons; Leonardo Da Vinci was amongst the first to dissect the human body, trying to figure out the anatomy of the mysterious human body as well as to learn how it works. Till today, medical students still learn about anatomy in the same way. Below are some pictures that I've managed to capture with my mobile, not the best of quality. I apologize for that. Will be paying a second visit within these few days for more pictures of the collection, stay tuned. The Anatomy of the Brain with a Description of the Nerves and their Function (1664) by the British physician Thomas Willis (1621-1675) is one of the older items in the collection. A book from the founder of the circle of Willis! How fascinating! Bernard, Claude, 1813-1878, Illustrated manual of operative surgery and surgical anatomy. 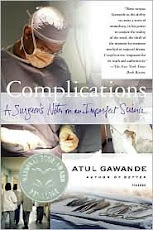 This book basically talks about surgical techniques involved in different procedures. Picture depicts surgical amputation of the upper limb(fingers). Insulin: Its use in diabetes/ Commonwealth Serum Laboratories, Department of Health, 1925. The therapeutic potential of insulin in maintaining glycemia in diabetic patients has been recognised since 1925! Cole's atlas of anatomy and physiology of the human body. (Melbourne : E.W. Cole Book Arcade, [191-?]). 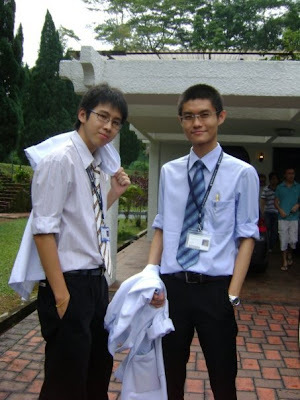 Early atas of human anatomy! Early prescription record in a local drug store. The anatomy of gravid uterus by William Hunter(Not the one who discovered the adductor canal)! Quite a renown anatomist 1718-1783. Intracranial Tunours: Notes upon a series of two thousand verified cases with surgical mortality percentages pertaining thereto/ by Harvey Cushing. 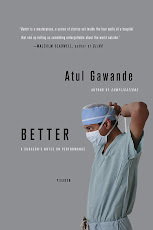 A book by the same neurosurgeon who discovered Cushing's Disease! Two scientists from PHI in Victoria are to receive medal honours from the UK Society for Endocrinology. The awards recognise their major personal contributions to international hormone research. 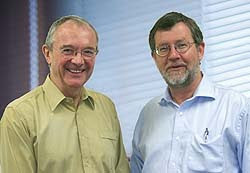 Professor Peter Fuller, Associate Director and Head of the Steroid Receptor Biology Laboratory at PHI, is to be awarded the 2011 Hoffenberg International Medal. 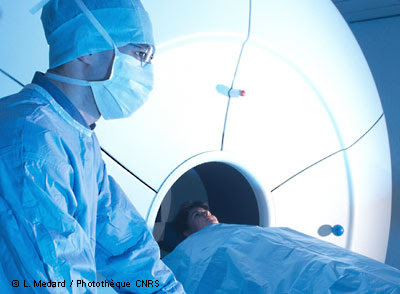 The award, which is made to an endocrinologist judged to have made outstanding contributions to hormone research, also promotes international collaboration between researchers. I reckon another cake day is on the way to celebrate Prof Fuller's achievements. A knowledgeable clinician with an absolutely humble character. Still cant believe I'm going on ward rounds with him tomorrow. On another note, I just realised that I haven't been doing what I am supposed to do since I landed in Melbourne. - My virgin visit to the club! Who is up for it? It is Friday once again and today concluded my second week of studentship in Prince Henry's Institute. Life as a student here is never mundane as everyday is different. You learn different things/techniques, you make different mistakes, you meet different people, you hear different codes(code blue/code red) and you attend different seminars. Quite variable. There is an explosion of knowledge in Prince Henry's itself and It makes it hard for me to digest and catch up. I reckon it is fundamentally crucial for doctors or even medical students to keep themselves(or at least try to) updated with what is happening in the medical field from time to time. One of the best resources that I think is absolutely useful is Medscape. Just subscribe to their newsletters in various fields and you could get heaps and heaps of updates/advancements and even clinical trials that are currently being carried out in different parts of the world. There are videos on panel discussion on every single topic you can find not forgetting the chance to earn some CME points at the same time. At this stage, year 2 medical students from Monash should probably be quite familiar with the drug Thiazolidinedione(TZD) which is used as one of the agent to control glycemia in T2DM patients. When I learnt about it last year, I was quite fascinated as this drug actually acts as an agonist to the nuclear receptor PPAR gamma to initiate transcription of insulin sensitizing genes. Interestingly, this is the same receptor that Simon and I are looking at right now in terms of tumorigenesis of granulosa cell tumor of the ovaries. However from a recent conversation with Jun, an endocrine fellow in MMC who is currently pursuing her Phd in PHI, I was told that one of the TZD, rosiglitazone was found to cause heart failure in patients by inducing water retention while messing up sodium balance. I then searched for this particular drug in Medscape and found an article written in 2001 claiming that Rosiglitazone could reduce cardiovascular mortality and morbidity in T2DM. I was confused for a while, wanting to know the real story behind this wonder drug. I then googled "Rosiglitazone FDA Heart Failure" and then a second article written in the year 2007 from Medscape appeared. Guess what? Roziglitazone really has an adverse effect and could precipitate heart failure, warned by the FDA. Pioglitazone which is widely used is currently being reviewed as well. I doubled checked, and It was valid. 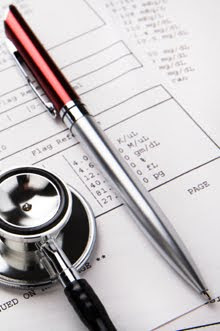 In a short duration of time, a drug can be known to cause harm, treatment strategies could be modified, guidelines are then being reviewed as frequent as possible. Frustrating huh? In medicine, things are constantly changing. Thus, this serves as a good reason for us to instill the habit of keeping ourselves updated even at this stage itself. Even in undergraduate, why not? Many still could not accept that fact that medicine is really a life long learning process. It is not a course, it is not a job, it is not a career either. It is a life. On another note, I attended a talk 2 days ago and was amused by the debate between the endocrinologists, diabetologist and the researchers. They were arguing about the use of insulin secretagogues in the management of T2DM. 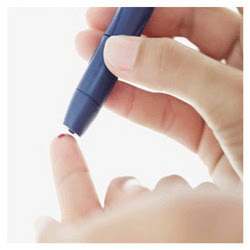 The researchers claim that insulin secretagogues like Sulphonylureas causes pancreatic beta cells exhaustion and on other hand, the endocrinologists softened their comments by saying that choices of medication is indeed limited. Was reading through Nature's Endocrinology review and there was an article saying that the current stereotyping of DM is oversimplified owing to the fact that the prevalence of "Double Diabetes" or better known as "Type 1.5 diabetes" has dramatically increased in both developed and developing countries. They argue that there is a need to review the current dichotomous classification of DM. Interesting isn't it, its never ending. New things come up every single day. Managed to catch up with Prof Fuller this afternoon when all the staffs of the steroid biology receptor lab celebrated over the acceptance of Amanda's thesis on the role of mineralocorticoid receptors in the context of cardiac fibrosis and heart failure. She is now officially a post-doc research fellow in PHI, nicely done! I expressed my intention of doing a BMedSc to Prof Fuller and we had a good chat about it. That concludes the day and I shall look forward to the endocrine ward rounds and journal club with Prof Fuller on Monday. A teaching session with the Endocrine Director of Southern Health without the presence of other medical students, how lucky. Hopefully the presence of inspiring figures like him will keep my passion for medicine burning. I'll have to admit that I am not a "family" guy. After 2 years studying in KL, I have never missed home. Perhaps this is due to the fact that Penang is just approximately 365km away from KL and I know that I am able to board a bus back whenever I want. As a son, I do call back home everyday, making sure everything and everbody is doing fine at home. Although it is just a short call, but It was sufficient, at least I know I am playing my role, as an integral part of the family, as well as the eldest son of the family. I am not sure whether It is really enough, but perhaps It is true that the time we spend with our family is never truly enough. I have been in the land of down under for nearly a week. Strangely during this period of time, I felt terribly home sick, exaggerated particularly when I come back home from work. The house is awfully quiet with all the housemates in their respective rooms. I felt truly isolated, detached from human touch. This is the reason why I look forward to work everyday, at least I could talk to somebody in the lab. Facing the four walls in my room, I started to look for people to chat online, I become so emotional that I requested for my brother and parents to come online more frequently. Why is this happening? I've never been so home sick before. There are moments that I ponder, why the heck I am doing here when I could have instead spend 2 months of quality time with my family. Perhaps it is true, this is a trade off, losing one quality of something for gaining another aspect. I am not entirely sure whether I"ve comprehended fully the upside and downside of this decision that I've made. But I know, no matter what, I need to complete what I've started with. In the school of medicine, there are lecturers, clinicians, surgens who got married very late in their life due to overwhelming commitments towards their career. Some even remain single until now. Dinner session with Wei Men and Rachel yesterday gave me a big slap on my face, forcing me to realise that there are so much more to life than academics. Relationsip, family and friendship for example. Dude, I'll have to admit that I am so envious of you two. I looked at my surrounding when both of them went to grab some food. I saw a few couples and families few tables away happily enjoying their meal, spending precious family time toghether. I was alone at the table, waiting for both of them to come back. I opened my backpack to get my bottle of water and heck what I saw is my edition of "Nature's review of Endocrinology and Metabolism", one of the journal that has the highest impact factor in the scientific world. I stopped for a while, so disgusted by myself. Strolling along Yarra River at night with both of them made the feeling more overwhelming. The night scenery was exeptionally breathtaking. Couples are sitting beside the river, looking at the high rise building of Melbourne city, spending romantic time together. I tried to maintain my composure when both of them are around. Again, I would like to thank them for the scrumptious dinner and also for being such an accomodationg host. Just like in Diabetes Mellitus where glycemia is a balance between insulin secretion and action. I guess my life is placed on a balance between career and human relationship. Is it terrible to come to a realisation now that somehow there are flaws in my life? After 2 years of struggle through medical school. It has been 3 days in Prince Henry's and I have come to an awful conclusion that I am an complete idiot in molecular biology. Due to the fact that I have a very limited knowledge and experience in lab techniques and molecular work, It makes it even harder to comprehend the stuffs and materials that were delivered to me. Even a simple task like handling micropipettes poses some difficulties for me. Things like handling the biohazard hood for tissue culture and the required fundamental sterile techniques are so unfamiliar to me. Sometimes, things that we perceived to be useless and waste of time in the past could come in useful and handy in the near future. So I reckon a good student is like a sponge, constantly absorbing all the knowledge and materials that are delivered to him without doing any selective studying. So I guess, its time for me to revisit some of the epidemiology and the public health topics covered in these 2 years. Within 3 days, I've experienced an explosion of knowledge and has been able to witness with my own eyes how science and medical research could have such a big impact factor in our daily life, especially in health care. All the researchers and students in PHI are incredibly passionate about the work that they're working on. Some of them even discuss and talk about it over lunch breaks, reading journals, trying to keep themselves up to date with the latest research in the scientific field. It really does give you the feeling that you are currently in a tertiary research hub. This does not only apply to PHI, It also applies to the people from MIMR, the doctors involved with research work, basically the whole scientific community of Southern Health. This is the main reason why Monash is at the forefront of medical research-excellent environment for scientific work as well as a bunch of dedicated people. In PHI, there are seminars and forums being held once in a while. All the staffs and students are required to attend the talk no matter who the speaker is, to show respect to the invited external speaker ( It could be internal speakers at times). When talks are being scheduled, Dr Simon or other people in the lab will not hesitate to update me about it, making me feel like I am really part of the group. I've been fortunate enough to be able to attend two of the seminars held recently. The first one was on "Novel medical therapies to cure ectopics" by a researcher from Centre for Cancer Research, MIMR discussing about the potential use of Epidermal Growth Factor Inhibition in conjunction with Methotrexate(MTX) which also serves as an anti-neoplastic drug to cure ectopics. The second one actually revolved around the role of apoptosis/apoptotic cell death in folliculogenesis. Will blog about them soon, more reading to catch up with before I am able to write about that. The steroid biology group meeting was held yesterday morning chaired by Prof Fuller. This is a venue for each member of the group to evaluate their own progress and also to get updated with what others have been doing over the week. In that meeting, James was presenting on his work which deals with glucocorticoid and mineralocorticoid receptors. Have you guys ever wondered why mineralocorticoid receptor has glucocorticoid activity (i.e cortisol can bind to mineralocorticoid receptor) but on the other hand glucocorticoid receptor has high affinity and specificity only towards cortisol and not other mineralocorticoids. Extensive studies are being carried out in PHI itself, looking into the structures, genes and functions of these receptors, they've managed to narrow down to a few amino acids that are responsible for the difference between the 2 receptors. Not far from now, perhaps in Guyton or Ganong, there will be a section that explains why this happens. I truly believe, clinicians who are active in research are at the forefront of medicine. As clinicians, they are familiar with the clinical aspect of their work, but I guess It is still due to their inquisitive nature of their character and their hunger for knowledge that got them into research. 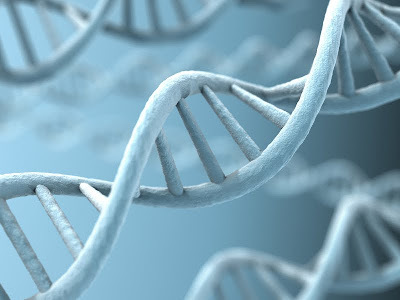 Isn't it fun to know how things work even if It requires you to look into the molecular aspects of it? One of the perks of research I would say! Today marks the first day of me working in Prince Henry Institute of Medical Research as a vacation scholar. 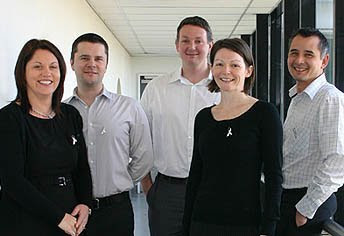 I was fortunate enough to be awarded the Summer Vacation Research Scholarship by the Cancer Council of Victoria @ $250 per week and will be spending 10 weeks working on the molecular pathogenesis of Granulosa Cell Tumour(GCT), which is a rare form of ovarian cancer under the steroid receptor biology group spearheaded by Prof. Peter Fuller. I woke up early this morning feeling extremely ecstatic. Took my breakfast (Milk+Cereal, cant afford other than this), and then had a slow walk to the hospital which is situated only 15-20 minutes from my place. Prince Henry's Institute is a non-profit medical research institute situated in Monash Medical Centre(Central Clinical School) together with some other renown tertiary centers such as the MIMR(Monash Institute of Medical Research). Prince Henry's Institute is renowned for its research in reproductive medicine as well as endocrinology, the study of hormones and it's signalling pathway. The main reason I chose to work under Prof Fuller is because he is one of the few clinicians who are extremely active in research, who will probably be the best person to provide me with valuable insights regarding the future career prospects in academic medicine. I love clinical work a lot that I am certain and definite that I would not dedicate my medical career into pure research, instead I aimed to contribute as much as I can to the advancement and development of medical knowledge by indulging myself in some sort of clinical research somewhere down the line. Instead of being just a consumer, where I am only confined to gaining and leeching knowledge from some other's work, I would want to be acclaimed for my contribution in the medical arena. Ask any students in Australia who is pursuing a biomedical related degree and they will be happy to name you a few research organisation which have been well established over the years. Names like Burnet, Peter Mac, MIMR, PHI, Baker are well known among the local students. Indeed, I am very fortunate to be part of this leading research institute, no doubt it enables me to have a sneak preview of what research is going to be like. Throughout this 10 weeks, I will be particularly looking into the role of PPAR (Peroxisome Proliferator-Activator Receptor) in the pathogenesis of GCT. Lots of reading up to be done before the research group meeting that is going to be held tomorrow morning. p/s : As a vacation scholar, you get your own office like the honours and PHD students, you get your own locker ,you get to see what's 2 dimensional gel electrophoresis and also a DNA sequencing machine! Dr Simon Chu, on the right end corner who is going to be my main supervisor has returned to PHI as the Loreal Paris Research Fellow after 2 years studying overseas. In his projects, he will be exploring the origins of some of the most serious form of ovarian cancer. The silver ribbon that they're wearing was introduced by the OCRF(Ovarian Cancer Research Foundation) and the main objective is to raise awareness about Ovarian cancer and also to raise much needed funding support towards finding an early detection test for ovarian cancer. Mom cried while she was sending me off at the airport. "It's just for 2 months" I said, patting her at the back, thinking that she is making a big fuss out of this. To me, I failed miserably as a son. Haven't been spending sufficient time with them and my siblings, the sense of guilt is overwhelming. I boarded the plane at 12.40 pm with Amanda who is visiting her friend over in Clayton. I looked at the map and realised that Australia is not really far from Malaysia, yet the whole journey took 8 hours. Looking at the sky in the plane, I managed to put my worries, burden at the back of my head for a while. It was beautiful. I can see ice forming outside the window due to the low temperature and Amanda started taking shots at it using her new DSLR. The night scenery of Melbourne City from the sky is truly breath-taking. Just by looking at the lights from above, I can tell that this city is well arranged. Amanda met up with her friends after that and that left me alone in the airport. Had to sleep over in the airport yesterday as I arrived at 12 midnight. Took me quite a moment to get used to the currency. Bought a vanila shake from MacD and found a good spot at one corner to sleep over. It was cold in the airport and even with both my jackets on, soon I noticed that my fingers and nail beds were turning blue. Thanks to the body's homeostasis, I managed to conserve some heat via peripheral vasoconstiction. It was a rough night, but It was thrilling. I managed to get a few hours of poor quality sleep. The fear of loosing my luggage kept me awake every now and then. I checked whether my passport and wallet are still with me constantly, just in case. It was 5am in the morning, I bought myself a cup of steaming hot coffee that costs me 3 dollar and headed towards the bus station to wait for the shuttle bus that is scheduled to bring me straight to Monash Clayton Campus. While waiting, I enjoyed observing the people around me with a cup of coffee in my hand. The morning breeze was exceptionally fresh, I took a deep breath in and told myself, "you're a lucky man cyc, this is gonna be a hell of an experience". The VIA(Vertically Integrated Assessment) paper that I sat for yesterday morning marks the conclusion of year 2 of the MBBS program. Instead of feeling relieved, I felt lost as soon as I step out from the exam hall, and I sighed. It felt weird for not having any particular tasks to accomplish after the daunting exam. I guess I am still better adapted to the busy, fast pace, mundane kind of lifestyle. Goals and tasks keep me occupied and focus, almost all the time. Year 2 indeed has been a roller coaster ride with its ups and down. I'll have to admit that It has been the toughest academic year for me so far, to the extend that I am just too tired to do anything else except to get sufficient sleep once I reach home at almost 12 midnight everyday. The study load is just enormous and the level of stress increases exponentially due to the back to back assignments that might at some point perceived to be unreasonable and a total waste of time. However, I'm glad that its over. Deep down there, I know I will be roaming around the wards next year, engaging myself with patients. The "real" medicine finally begins. Here comes the end of the year and I shall summarize some of the highlights that I reckon to be significant in my journey as a medical student. 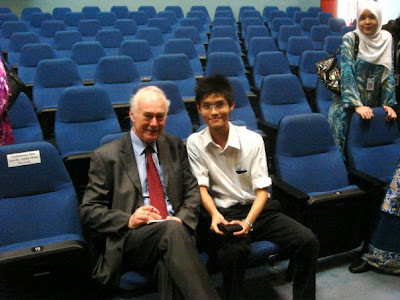 1)Attended a public forum by Sir Matin Evans, nobel prize winner for medicine in the Academy of Sains Malaysia. Took a few shots with him and managed to obtain his signatures together with a few words of wisdom. "Knowledge and Understanding", those are the 3 words he wrote on my writting pad. 2) Donated blood for the second time in the interval of just 6 months. Donated 350 mL instead of 450 due to the fact that I am underweight! 3)Finally turned bald after god knows how many years. A bald head + severely cachexic figure = people tend to mistaken you as an intravenous drug user. It was fun for a short period of time as people tend to pay more attention on me and of course, the girls like to touch and play with your head. 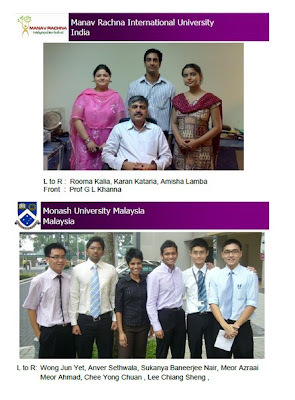 4)Represented Monash in the 7th interuniversity physiology quiz held in UM. I am so proud of the team's acheivement for emerging as Malaysia's top university after NUS and Chulalongkorn University beating UM and a few good local universities despite the minimal contribution I've poured in. 5)Celebrated my 20th birthday in the Uni. My colleagues and juniors were awesome people. Thanks for making it a memorable experience. The number "2" is somewhat intimidating to me. 6) Awarded a summer research scholarship by the CCV(Cancer Council of Victoria) to spend 10 weeks in Prince Henry;s Institute if Medical Research/ Monash Medical Centre to work on granulosa cell tumour of the ovaries. 7) Met a few really inspiring figures that serve as a motivation for me to strive harder. My flight has been scheduled on the 19th, its just merely 6 days after my last paper. I feel so sorry for my parents, for not being able to see their son often throughout these 2 years. I am always somewhere out there, exploring opportunities, hardly even spend time at home. Its a mixed feeling. But well, I guess I'll just have to try harder in juggling my time between studies and family. Could not afford to lose the warmth of family/relationship for the coldness of a scalpel couldn't I?